Happy Thanksgiving week! I don't know about you, but this girl is ready for some turkey, green bean casserole, corn pudding and of course a couple of pieces of pumpkin pie. Bring it. Hope everyone enjoyed the last weekend before the holiday hustle and bustle officially begin. I know I took full advantage of it, so much so, that I am starting my weekend recap with Thursday. A few girlfriends and I headed to the annual Junior League of Austin, A Christmas Affair. Think shopping, shopping and more shopping with cocktails. We go every year for Girls Night Out. If you live in the Austin area, make sure to put this on your list of things to do next year. And yes, I did bring those cups home with me and was the only purchase I made for myself, however, I really wanted that pony. After shopping, sipping cocktails and hitting up some sushi for dinner, I persuaded my friends to go to the Austin City Limits Moody Theater to see if we could weasel our way into the Willie Nelson concert. I am still not quite sure how we managed to get in for FREE, but I wasn't going to ask any questions. We didn't get to see the entire show, but made it for 6-7 of his songs. We felt like teenage girls sneaking into a R rated movie, so giddy and giggly. We thought we were invincible enough to make it backstage after the show. I mean, we were on a roll. The cards were in our favor, right? Nope. We got DENIED. Oh, well, it never hurts to try, right? I must say, this is one night I will never forget and still smiling about it today. Friday was pretty low key. My all-time favorite movie, Footloose was on CMT. I never pass up a chance relive the days when all I wanted to be in life was Ariel Moore and wear those red boots. And Ren McCormack, I mean, they just don't make 'em like that anymore. 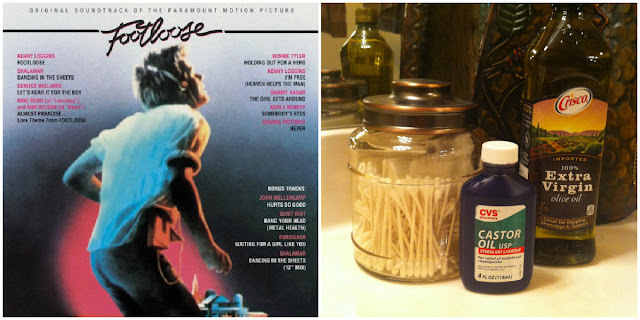 I gave the oil cleansing method that I talked about Friday a whirl. I must say, it was AWESOME. My face never felt so soft and clean. I never in my life thought I would put something on my face that helps people use the restroom. Kinda gross, but I am willing to try anything these days. I'll keep y'all posted on results. My mom and dad came into town to visit which equals FREE babysitter. So, you bet your boots, we were going to take full advantage of a date night. We went with some of our best friends for sushi. That would be sushi twice for me in one week. No complaints. 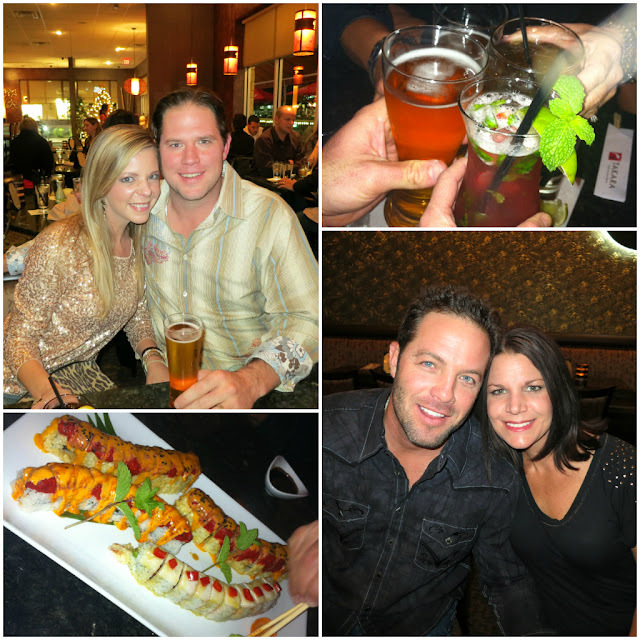 If you live in the north part of Austin, Tarkara Sushi is one you have to visit. I am a sushi snob, and only like a handful of places around town. This one definitely gets my vote. We love to country dance, but don't get the chance very often. Wild West opened recently and is another one to hit up if you live in North Austin. They have some live music lined up too. 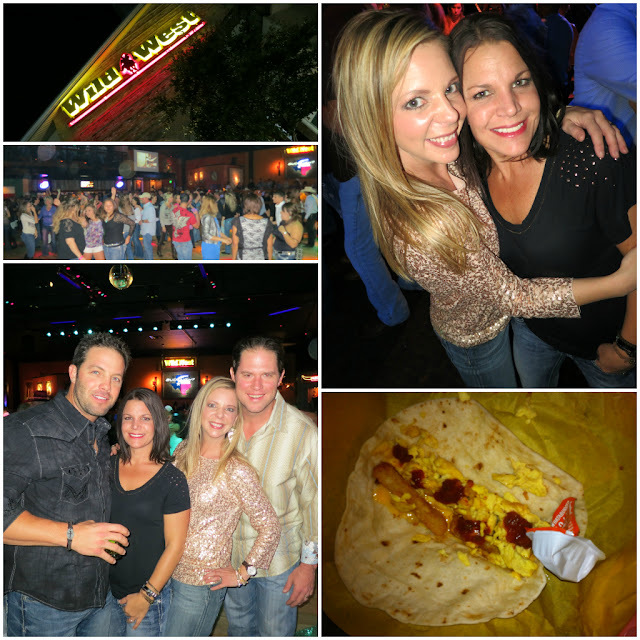 Just to name a few: Wade Bowen, Roger Creager, Randy Rogers and Kevin Fowler. It was a great crowd, big dance floor and they played a little Baby Got Back. Any venue that plays this classic will get my business in the future. So.much.fun! And with all that dancing, we worked up a little bit of an appetite. I mean, sushi only sticks with you for so long. Anyone care to guess where we went and what I ate? I know, it looks like a hot, nasty mess. You have to trust me when I say, it's the best, after a night out, drive thru on the face of the planet. 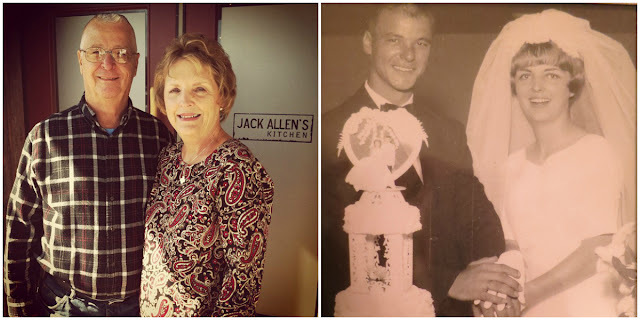 The best part of the weekend was being able to spend the day with my parents on their 45th wedding anniversary. Those that know my my mom and dad, know what an example they are when it comes to making marriage last. Their dedication to and admiration for one another is what every couple should strive for. They have been a solid foundation in my life and am so blessed to have two parents that wholeheartedly love one another and will continue doing so for eternity. They are the most down to earth and genuine people you will ever meet and I am proud to call them Mom and Dad. I love you both!! 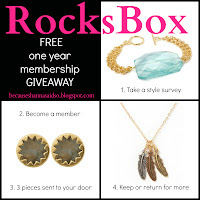 Today is the last day to enter the RocksBox giveaway. Who doesn't want to win jewelry for an entire year? P.S. Make sure to come back tomorrow because the biggest group giveaway in this blog's history is happening bright and early. You won't believe all the prizes! Christmas is definitely coming early around these parts! I am linking up with: Leeann, Dana and Sami for the Weekend Update. I love your outfit for the Girl's Night Out event!! I was lookign for a nice floral scarf today but could not find one :/ I love the original Footloose...it's awesome 80's plus Sarah Jessica Parker is so cute in it!! I seriously will need a week to visit you so we can go shopping and do country dancing and eat sushi!! Happy anniversary to your parents!! Loveee that sparkly top you wore on your date night. Happy Anniversary to your parents! I cannnnnnnoooot believe that Willie Nelson pic was REAL!!!!!!!!! I am DYING! Okay...in addition to Abby, we have other people in common. I went to high school with the Crim girls! So funny! what a fun weekend! nice job getting in for free too! Looks like you had so much fun! Love your pictures - and outfits! I cannot wait for Thanksgiving and my huge family all together! However, my Mom is not making pumpkin pie. Not sure if I can ever forgive her for it. Looks like you had a party and a half! You look so happy ;) and beautiful I might add! Looks like you had an AWESOME weekend! Makes me want to scoot on down to Austin with my hubby (sans kids) for a weekend trip. We have a JL shopping thing here. It was this past weekend. I used to work at them so I haven't been in the years since I stopped working. My favorite night was the cocktail night though! I NEED to know where that gold sparkly top is from! I want it! Oh man I love me some Footloose! Now I have that song stuck in my head. I'm loving your outfits, you look so pretty! What a great weekend you had. And I'm totally intrigued by the oil cleanse, you'll have to keep me posted on how it goes because I think I might want to try it too! What a fun weekend! 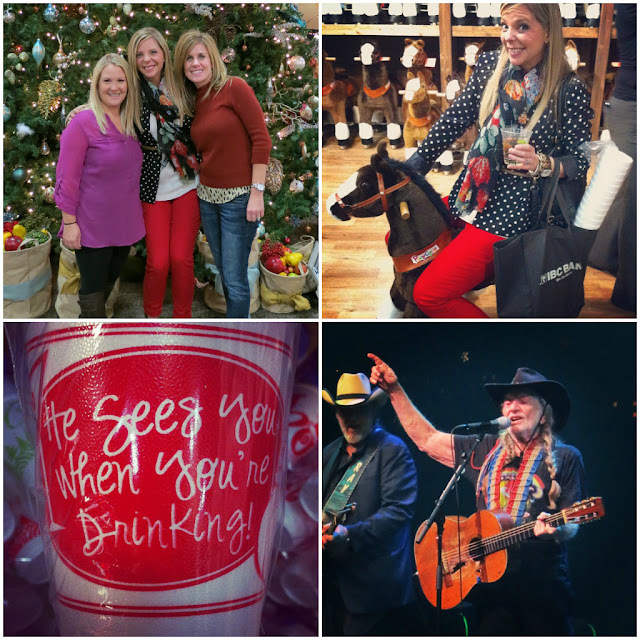 I'm definitely jealous of your Girls' Night and Willie! Great pics! I loved that shirt you wore for Date Night! Happy Anniversary to your parents! What a sweet couple! Happy Thanksgiving to you and your precious family! This looks like a really freaking awesome weekend! Not to mention you looked adorable the whole time! Can I come down next year for that holiday show because that looks like so much fun! I'm glad you tried the oil cleansing method! I hope it works as well for you as it has for me. SUPER jealous of your free Willie Nelson concert. I love him. Willie Nelson, country dancing!! Fun weekend!! Happy Anniversary to your parents!! What an accomplishment. I need that sparkly sweater Shanna. Swooooon!!! You look just FAB! Willie Nelson is coming to Augusta too! Wild West looks like my kind of bar...we have a place like that here called Country Club--country music early in the night then late night booty mucic!! Looks like ya'll had a good weekend! I NEED those cups SO bad.... maybe I can find them around here! So cute!! AHHH YOU SAW WILLIE?!!?!??! i die! i have a lifelong dream of seeing willie nelson in concert!!! 45 years! WOW! Incredible! Love it! I am now having sushi for lunch. With green bean casserole on the side, thank you friday thanksgiving luncheon last week. Big congrats to your rents on 45 years! That's amazing! omg I love that you snuck into the Willie concert! Sounds like a blast girl! Your weekend rocked! What a super fun weekend! You did so much! I really want to try that oil cleansing method based on your review of it. And happy anniversary to your parents! That's amazing! Awesome weekend beginning with Thursday!! So jealous you got to see Willie!! So much fun! Happy Thanksgiving...have a great week! I LOVE the polka dots with the floral scarf outfit! It's so adorable - your style is great! Be sure to enter my custom phone case giveaway! I love your sparkly top Shanna! Beautiful as always, looks like a blast. So jealous of going country dancing! Nad happy anniversary to your parents! Well finally one thing we don't have in common.. Sushi. But we still love each other. Happy anniversary to your parents! I am sure glad they boinked and had you! Love you! I'm in LOVE with the sequin top!! It looks great on you girl. congrats to your parents! quite an accomplishment! love the sequin top! I'd say you had an awesome weekend, all the while looking fabulous as always:) Happy Monday! Now that's what I call a weekend! I think you get the best weekend award because you were up to so many fun things! How awesome that you got into the concert for free!! You're my idol. And that pic of you and your husband where you're wearing the sequins is so pretty! omg. wild west!! that was the place to be when i was in college! way too many fun nights happened there! What an absolutely fabulous weekend!! I was so sad to miss all of the Junior League events this weekend!! It seemed like they were happening there, SA and Houston and I missed all of them! Boo!! What a great GNO and Willie?? Yes, brings back great college memories! Such a great friends/date night!! Your sushi looks delish! Happy Anniversary to your parents!! They don''t look much different now then the day they got married! What great role models! Hope you had a great Monday friend! Looks so festive around your parts, pretty lady! I am so ready for the Thanksgiving feast, bring on those crispy green bean bits! I could eat sushi every day of the week! I'm also a total sushi snob and only like 2 places where I live. Unfortunately for my wallet, they aren't the cheapest. Haha! That looks like a fantastic weekend, and free music is always the best music! Fun weekend! Those sushi rolls are making my mouth water. Congrats to your parents... I love hearing about couples like them, such happiness!